If you’ve been a reader of my blog for any amount of time, you know around this time of year I am usually getting into pumpkin fever. It would be only a matter of time until I made these Vegan Chocolate Chip Pumpkin Donuts for my loves and my friends. These donuts are the most perfect way to celebrate fall’s cooler temperatures. For some of you it’s actually very cold. For us, it’s sort of cooler. I have been wanting to share fried donuts here, but honestly, I prefer baked. Baked donuts are so much lighter and just so fluffy. I don’t feel so guilty afterward when I eat one (or two!). Is pumpkin pie filling the same as pumpkin puree? Not exactly, as pumpkin puree is just pumpkin puree. Pumpkin pie filling has additional sugar and also spices. Pumpkin pie filling is ready to make a pie. I’m not suggesting you use this for these donuts if that is all you have on hand. You have to suffer out your craving and wait until you get some pumpkin puree. What do you do if you don’t have a donut baking pan? 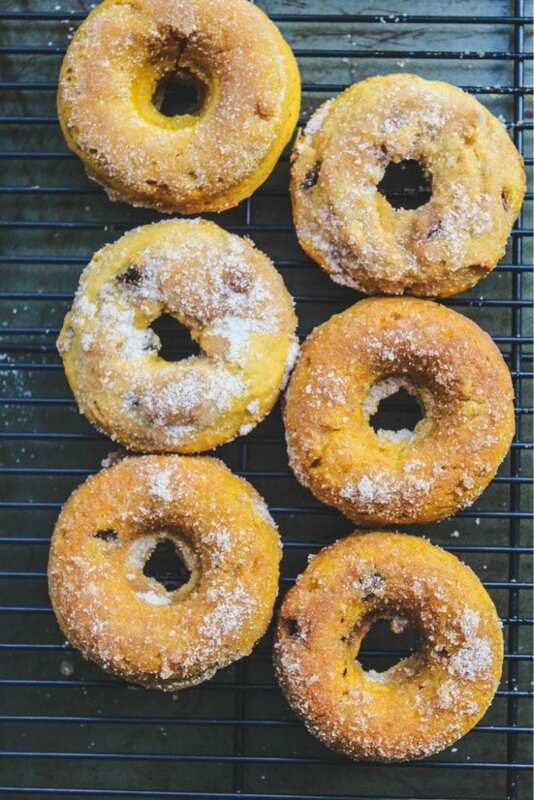 You could totally make these donuts in mini muffin tins, or even a regular muffin tin. Follow the recipe along with the dipping in the melted butter (I used margarine this time, as I made them vegan)and dip in the cinnamon sugar. 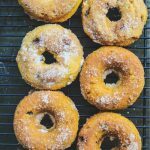 How do you make Vegan Chocolate Chip Pumpkin Donuts? 1. Whisk together the dry ingredients and also the wet ingredients. 2. Stir the dry ingredients into the wet ingredients. Fold in chocolate chips. 3. Spoon batter (or use a pastry bag)into your prepped donut pan. 4. Bake donuts for 10-12 minutes. 5. Release donuts from pan and allow to cool on a rack. 6. Dip donuts into melted margarine and dip into cinnamon sugar. 7. You could mix this by hand or you could use a mixer. How do you make a flax egg? To make a flax egg, mix one tablespoon ground flaxseed meal with three tablespoons of water. Mix together, and let sit in your fridge for 15 minutes until it thickens. It is very easy to make! So many other pumpkin ideas on my blog. 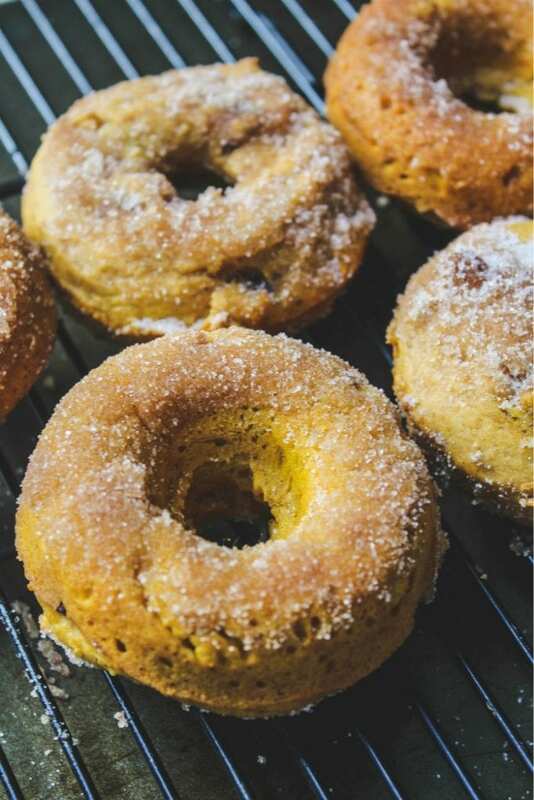 You know I have been a pumpkin fan for quite a while and have shared these donuts with you (basically similar recipe as this one, but made with butter and regular milk). This challah (yes, it’s a pumpkin challah!!). How about these brownies (oh, YESSS…chocolate and pumpkin swirl). Or this amazing BUNDT CAKE!! So, yes. There is something pumpkin for everyone here. Check it all out. Or just make these donuts and eat one or two of them (or 3!). No judgement.I used these dairy free (allergen free)chocolate chips from Nestle. They’re fantastic (just my opinion, not sponsored opinion). I used vegan sugar and added molasses to make my own brown sugar (in case you wondering if the sugar is vegan). 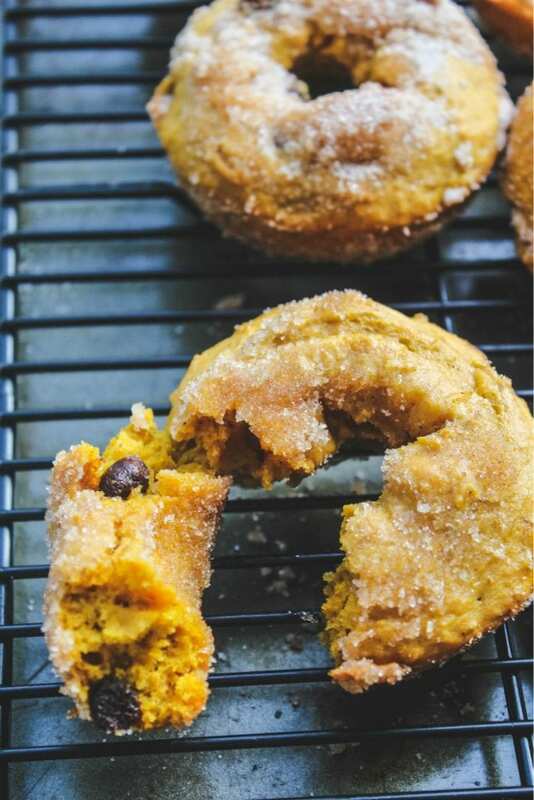 Baked pumpkin chocolate chip donuts with a cinnamon sugar topping are an irresistible fall treat! These vegan donuts are a perfect afternoon snack or dessert. Preheat oven 350 F. Spray a donut pan with baking spray and set aside. In a large mixing bowl, stir together the flour, baking powder, salt and spices; set aside. In the bowl of an electric mixer fitted with the paddle attachment, mix oil, brown sugar, egg, vanilla, pumpkin and almond milk until combined. Slowly add in the dry ingredients and mix until combined. Fold in the chocolate chips. Stop 1/2 way in the process to scrape the sides of the bowl with a spatula and incorporate it well. Using a pastry bag, fill each donut cup with the batter. Fill almost to the top. Bake 12-15 minutes, or until donuts spring back when gently pressed. Turn donuts out onto a wire rack and allow to cool for a few minutes. While the donuts are cooling, melt butter in one bowl and combine the sugar and cinnamon in another. When donuts are still hot (but not too hot to touch), quickly dip each donut in melted margarine, then coat in the cinnamon-sugar mixture. Serve immediately.